The wind never backed off on Wednesday (launch day) so Ravenswing stayed at the ramp dock overnight. Yesterday Griffin, Charlie, his friend Larry and I took the boat off the dock for first forward motion. Here’s to thousands of miles of bow wake. 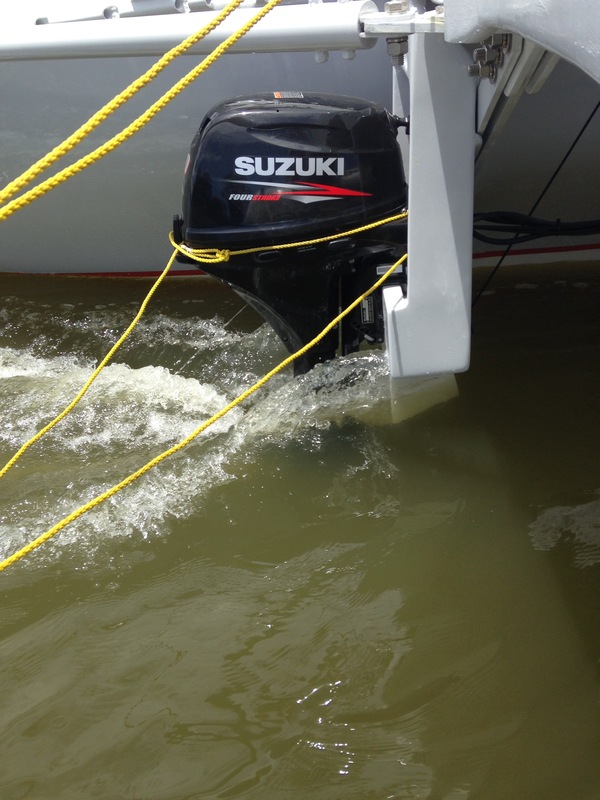 With just 18″ of dagger down and 2k rpm on the outboard the boat easily turned 180 in about its own length. The propeller and outboard are noticeably small but I think it will be ok – just have to be smart about it all the time. The yellow lines are makeshift motor steering. We’re going to figure out a permanent solution as this maneuverability aid seems important. 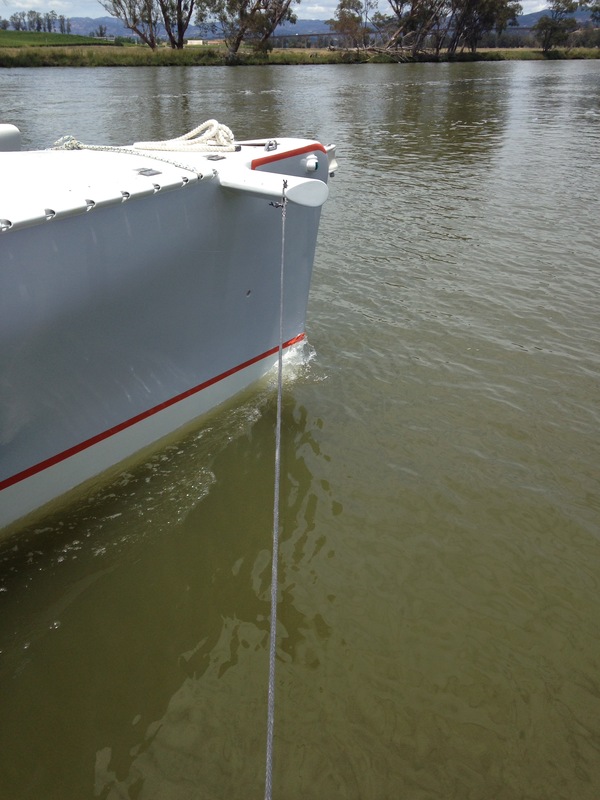 The motor say nice and deep, but the stern is dragging a bit without the mast up front, so we’ll wait and see about trim. 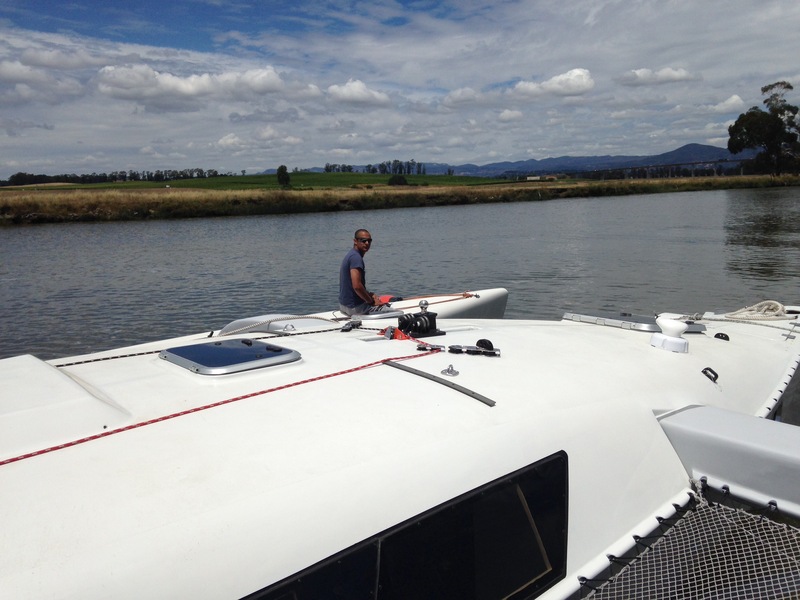 The weather was great for a 30 min shakedown, then docking at Charlie’s house on the Napa River. It’s a mile from the Napa Marina where the mast is waiting for weekend dressing. 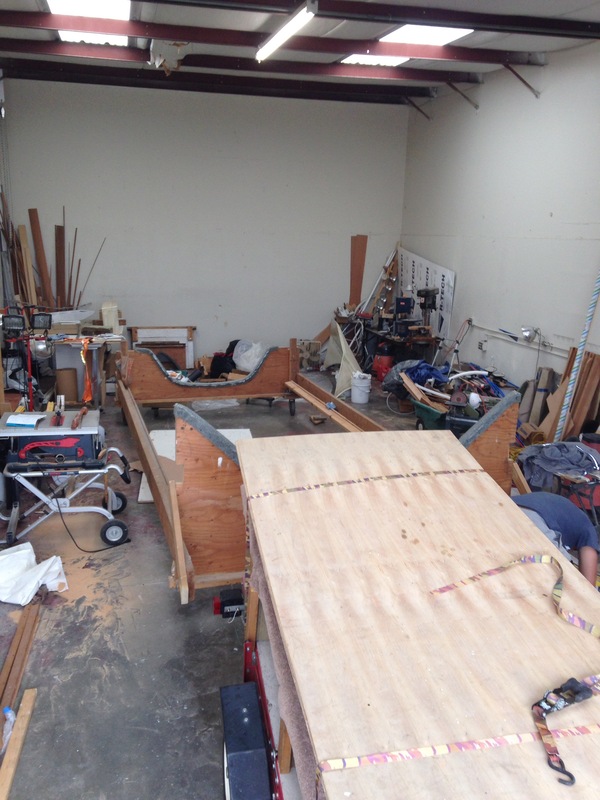 The bummer of day 1 was the daggerboard not lowering beyond the foot or so we were able to test last Friday in the shop driveway. Turns out the board gets a little bit thicker as it extends up from the bottom and this is enough to prevent deployment. Argh, one more back breaking pulling of the board and lugging it through Charlie’s wife’s yard to the pickup. Which led to six hours late night of templating, grinding off paint and power planing away excess fairing buildup. We had worked to build in more curve last year, but I was out of synch with what Howard had built many years ago with the exit slot. Tonight the dagger hangs in the shop like a side of beef, except this one is getting thin primer and bottom paint coats Fri/Sat for relaunch Sunday. New builders, don’t make my mistake of underappreciating the thickness of fairing, primer and paint. This has caused considerable pain over this weekend, first on the stuck starboard float and now the dagger in trunk. I should have painted samples with all the layers and measured with the caliper, and further adjusted the dagger core. 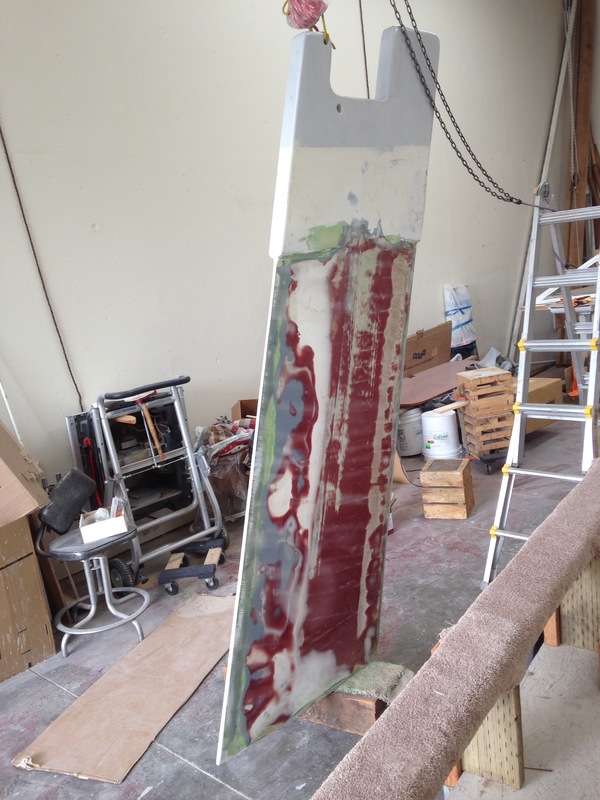 The float problem was just being greedy about cleaning up the beam sockets before final paint. Pretty dumb, as no one will see those parts of the boat and they were already waterproof and solid. The price of rework is frustration. In between paint coats we’re trying to recover from the weekof moving and assembling. The shop is worse than my room as a teenager. Now the trollies are gone and the trash pile grows. We’ll scramble to finish bolt-on parts including ladders, hardtop, pulpit, etc. before clearing it out over July 4 weekend. 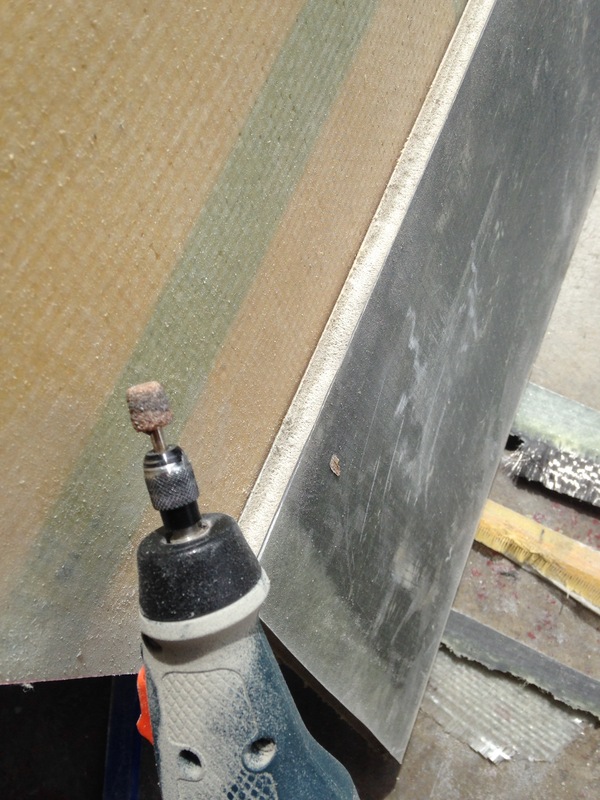 Here are the Kevlar and carbon hatch boards getting their edges rebated by Dremel. They’ll go to the boat this weekend to check before fairing and painting. Tonight let’s salute a talented sailor at the other end of the ownership spectrum. Captain Rick Holway is saying farewell to his beloved Newport 33 Pelagic Fantasy, as she gets her second owner now. Rick and Pelagic have been a force in the Gulf of the Farallons, winning racing classes, commodore-ing the Singlehanded Sailing Society and perhaps most importantly observing and counting the bird species of our coast. Rick, I thank you deeply for all the offshore mentoring you’ve invested in me this last decade. 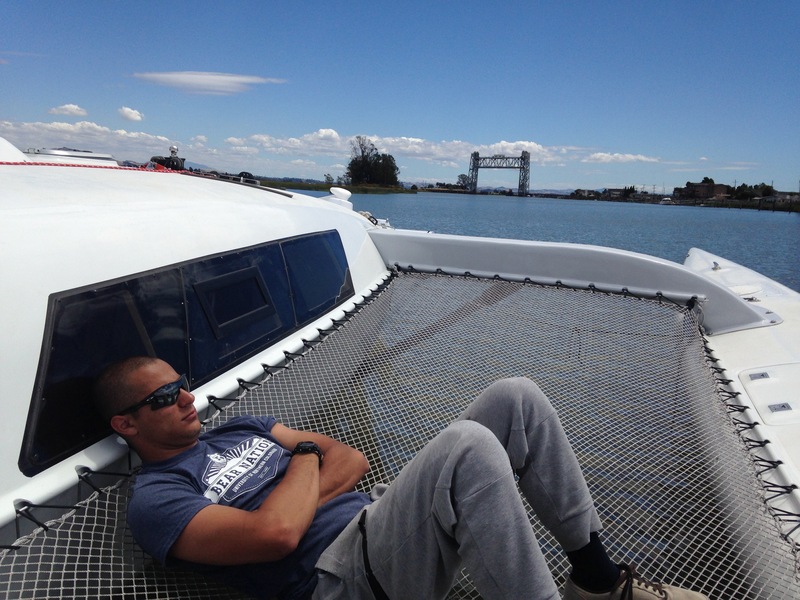 Boat ownership does not define a sailor – I think it’s the pushing off from a dock each day. And I’ll be a little selfish here to say it’s good you’ll have time on your hands now to sea trial and cruise Ravenswing. Still planning the mast stepping for Monday morn at Napa Marina. Let us know if you’d like to participate. Somebody has to channel Keith Burrage onto the boat! Thousands of pieces and parts went into “Ravenswing” Go easy on yourself mate, a few missteps are sure to happen.